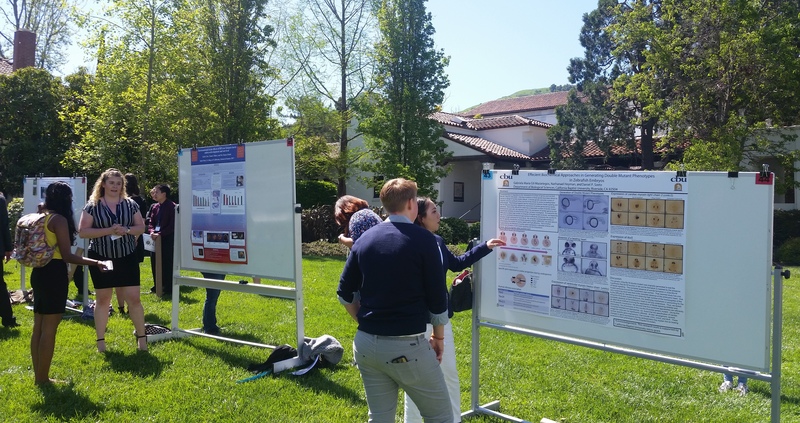 Saint Mary’s thriving undergraduate research community was recently spotlighted when the College hosted the 43rd Annual West Coast Biological Sciences Undergraduate Research Conference last month. Featuring approximately 150 oral and visual student presentations, the April 14 conference was attended by about 300 people, including students from 40 schools across the country, some from as far away as Alaska. More than 40 Saint Mary’s students were involved in several different capacities, including as judges. Notably three SMC students received honorable mention awards for their presentations at the symposium. “People recognizing that we have a vibrant science community at Saint Mary’s College is a valuable for enhancing the reputation and visibility of our science programs,” said Associate Professor of Biology Vidya Chandrasekaran, who chaired the conference. Founded in 1976 at Santa Clara University, the annual gathering provides a forum for undergraduate researchers to present original data they have generated in the fields of biology and biochemistry, as well as fostering interaction among biological science students and faculty from different schools. “For our students to see that their research is on par with the research at bigger institutions is something that’s very confidence-boosting for them,” said Chandrasekaran. “And the fact that they can go into these talks, understand it, and be part of it [is also valuable].” By serving as host, Saint Mary’s also supported an ongoing directive within the School of Science to highlight undergraduate research. Underscoring the strength of the initiative, there was record participation by science students in 2017 summer research opportunities. The keynote speaker for the conference was Pamela Lein, a professor of neurotoxicology at the School of Veterinary Medicine at the University of California, Davis, and an award-winning researcher of neurobiology and the effect of the environment on the brain. Her lecture focused on her research on autism spectrum disorder and the environmental factors that may lead to its development. “I’ve really just been stunned by not only the breadth of the science, but also the sophistication,” Lein said of the undergraduates’ research. Presentations by Saint Mary’s students covered a wide range of topics, including environmental toxins, the micro-animals known as tardigrades, and even social cooperativity. Honorable mentions were awarded to Katherine Whiting ’19 for her oral presentation in the cellular and developmental biology category and to Kyla Cole ’18 for her poster presentation in the same category, and to Kirsti Dunckel ’19 for her ecology and evolution poster presentation. Other participating SMC students and alumni included Rachel Henley, Krystal Karunungan, Brandon Adams,, Cody Upton, Fabiola Zaragoza, Brittany Jensen, Chane Cilliers, Ashley Arancio, Juliann Jugan, Andriana Albini, Sarah Brecht, Kendahl Montanez, Amanda Hassard, and Mallorie Manimtim. “We were all so impressed with the level of undergraduate research! As some of my colleagues and I were saying, we wish that our research was that good as undergrads,” said Dr. Sonya Schuh, an Assistant Professor of Biology at SMC, and one of the conference organizers.